Growth mindset is a trendy term these day and while it should not be the be all and end all of how we teach kids, I do try to teach my kids to persevere when they have a goal, even when the going gets tough. 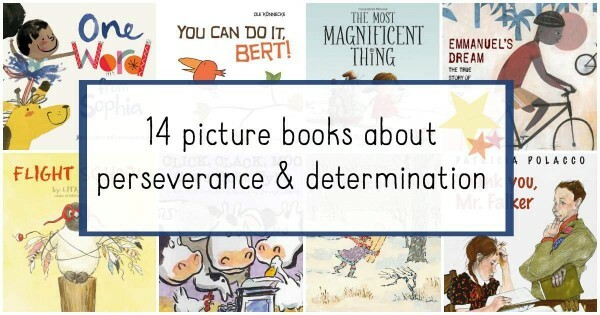 These picture books about perseverance are some of our favorites. The Most Magnificent Thing Having a can-do attitude like the protagonist is a must for any person wanting to make make her mark in the world of science and technology. With the help of her assistant dog, a “regular girl” decides she is going to invent a most MAGNIFICENT thing. She has a lot of false starts. Nothing seems to be turning out the way she wants and it’s so frustrating for her! However, she takes a walk, comes back and looks at her inventions afresh, and finally figures things out. I adore the “lesson” in the book, that success comes only after “failure” (something my kids learned about failure and how it makes you think like a scientist during our diy science camp). You know: trial and error. The book is not at all preachy and Spires’s illustrations are a delight. Emmanuel’s Dream: The True Story of Emmanuel Ofosu Yeboah. Emmanuel was born in Ghana with only one leg. Most children with disabilities didn’t go to school, but Emanuel was determined and hopped two miles each way to attend school. After his mother died, he decided to honor her last words by proving “that being disabled does not mean being unable.” He completed the astounding feat of bicycling 400 miles in 10 days. To say the least, Emmanuel’s is an inspiring story, and Thompson and Qualls do great justice to his accomplishments. An author’s note describes his continuing work and successes on behalf of disabled persons in Ghana. As Lita Judge is one of my must-read children’s author/illustrators, and Flight School does not disappoint. A young penguin may not have exactly the right body for flight, but he has the “soul of an eagle.” Eager to enroll in flight school and learn what it takes to soar, he is not discouraged. Fortunately, the other birds are so taken with his determination they do what it takes to make his dreams come true. Utterly delightful. A Chair for My Mother is a gorgeous book about familial love and how much of our determination to accomplish a goal is motivated by family. The narrator, a young girl, describes how her family lost everything in a fire. They found a new home and their neighbors donated furniture but what they lacked was a comfortable chair for her mother to rest in after her days of work as a waitress. The family saves their change in a jar and when the coins finally reach the top, they set off to buy the perfect chair. The story is quietly appealing and shares a valuable lesson not just about perseverance and love, but about recognizing that for many families, having a good chair is a luxury. Rosie Revere, Engineer is a wonderful companion book to the earlier and similarly themed Iggy Peck, Architect. Imaginative Rosie loves to tinker, build and invent. She gets discouraged when her inventions flop on the first try. Her wonderfully eccentric great-great-great aunt, however, explains to her that a flop is a successes because it paves the way for the next step in the inventive process. I love this message because it encourages kids to keep trying and trying – that genius talent is not necessary for success. It’s perseverance that helps us improve. The rhyming, winsome text is infectious and the illustrations are full of imaginative inventions that will get kids chatting. Click, Clack, Moo: Cows That Type. If you want to raise kids who won’t let their future employers walk all over them, read them this modern classic about a group of determined barnyard animals who persevere to get what they want, despite a grumpy farmer. You Can Do It, Bert! by Ole Könnecke made us laugh out loud with its surprising twist. I will absolutely not give it away, so don’t even ask. This is a lighthearted and gently humorous tale about a bird who is about to have a first time experience. Will he go for it? How will his friends react? My son was so delighted with this story that when his dad came home, he had to read it to him, just so he could recreate the magic of the moment when the reader finds out what Bert is really up to! One Word from Sophia. Sophia’s one true desire is to get a giraffe for her birthday. She prepares elaborate, individualized presentations to argue her case before each family member: a judge, businessperson, lawyer and disciplinarian (grandma!). Can she win her case, and will she find just the right word to win her case and convince the jury? This book made us smile, especially since Sophia just would not give up! Amazing Grace. An interesting fact is that Laura Bush named this title one of her 5 favorite books of all time. Grace’s favorite thing to do is act out her favorite stories (and aren’t all children natural actors during pretend play?). She wants to play the role of Peter Pan in the school production, but her friends tell her she can’t because Peter is a boy, and not black. Her grandmother, however, shows Grace that she can be anything she wants, if she puts her mind to it. It so happens that Grace makes a delightful Peter Pan. Henry’s Freedom Box. This is the true story of Henry Brown, a slave who, when separated from his family was determined to reach freedom. Using his limited resources in an environment of great adversity and danger, and with the help of an abolitionist, he packs himself inside a crate and mails himself to freedom. Thank You, Mr. Falker. Tricia wants to learn to read so much, but the lines of text just don’t seem like anything but wiggly scribbles. Finally, in fifth grade she meets a compassionate teacher who helps her fulfill her wish. My son’s teachers started out the school year with this book as a teaching tool to address the importance of perseverance in education. Even when things seem impossible, you are never dumb, you just haven’t found the right method. The Boy and the Airplane and The Girl and the Bicycle. Wordless books are uniquely suited for encouraging extended conversations. In each story the child wants something so much he or she is willing to put in a lot of effort and patience to achieve the goal. Need tips for reading wordless books? I have plenty! 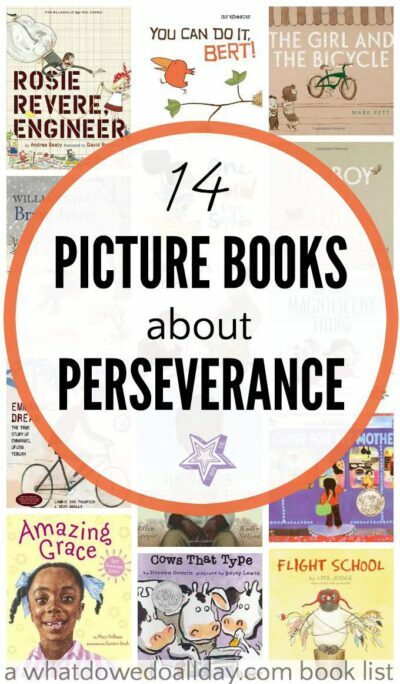 What books about perseverance would you add here? Don’t miss any of the upcoming book lists of the year! I publish a brand new children’s book list that parents can use to find high quality books for their kids. Subscribe to our newsletter and you won’t miss out. I would add “When Pigs Fly” and “Sink or Swim”. The first one is about a cow named Ralph who wants a bike and is told he can gave one when pigs fly. The second sees Ralph trying to learn to swim. Hi there, I would love to share a photo and a link to this post in a round up I’m doing on Perseverance for my monthly Family Focus. I couldn’t find your contact form or email so I hope it is ok to contact you here on the post. Would it be alright with you if I included you in my round up? Hi Missy, Thank you for asking! Yes, you can use one photo and a link. Please let me know when you publish, so I can check it out. It sounds interesting. I would add Luigi and the Barefoot Races. Little Engine That Could by Watty Piper. I haven’t seen anyone put this classic on a perseverance book list yet!